Electrum is a lightwight Bitcoin wallet focuses on speed and simplicity. It is lightweight because it requires low resource usage by connecting to remote servers that taps into Blockchain without downloading Blockchain itself, while it allows you to recover your Bitcoin wallet from a secret phrase. The official download page with the latest executable version is on Electrum.org. Go to https://electrum.org/#download​, select your target platform to start downloading. 2. Expand the downloaded .dmg. For OSX on a Mac, find the downloaded .dmg file (e.g. 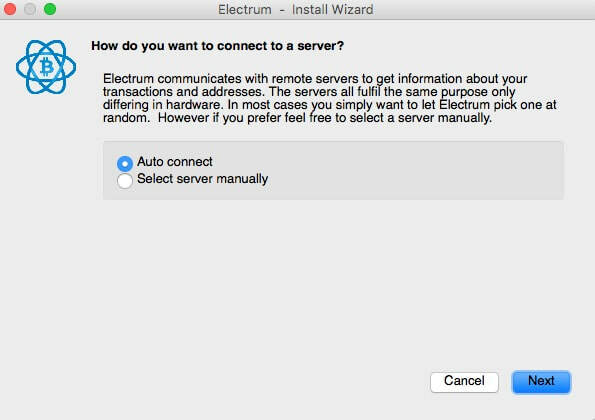 a file named "electrum-3.0.3.dmg"), double click on the .dmg file to expand it into a Electrum executable file, drag the expanded Electrum software into 'Application' folder on your Mac and the installation is completed. Please note, for security concern, to launch an application you downloaded from the Internet for the first time, by default Mac would not let you open it by double-clicking. 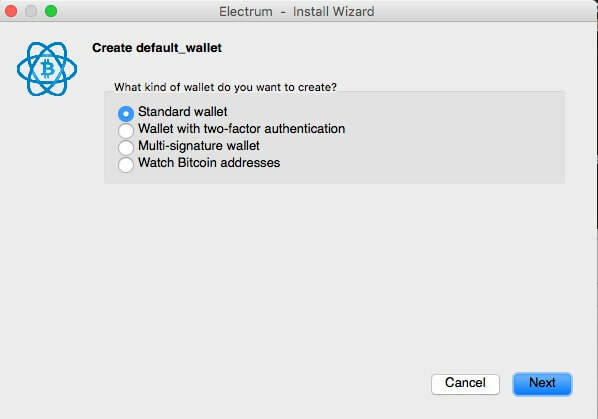 If you trust the source where you downloaded Electrum, in order to launch the Electrum wallet for the first time on your Mac, please locate it under 'Applications' folder, right-click on the application, select "open." 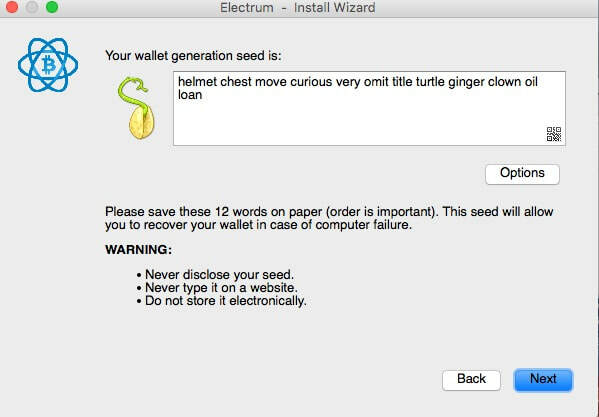 When you open Electrum for the first time, Electrum will take you through creating a Bitcoin Wallet. By default, the wallet will be named "default_wallet". Different kinds of Electrum wallet differs in whether the wallet can send out money or not, or how many people (signature) is required to send BTC, etc. Choose 'Standard wallet' so only one signature is needed to spend BTC. Alternatively, you can also use Electrum to manage non-HD wallet which means you can only manage the private keys of the addresses you imported into the Wallet. If you're not familiar with the concept of private keys, choose to go with HD wallet. That is, choose 'Create a new seed' to create a new HD wallet. Or, choose, 'I already have a seed' to restore your wallet into Electrum from a 12-word secret phrase you wrote down before. You should write down the secret phrase of the new wallet you just created. This phrase is required for recovering the wallet and your privilege to spend any balance associated with any private keys tied to your Electrum HD wallet. 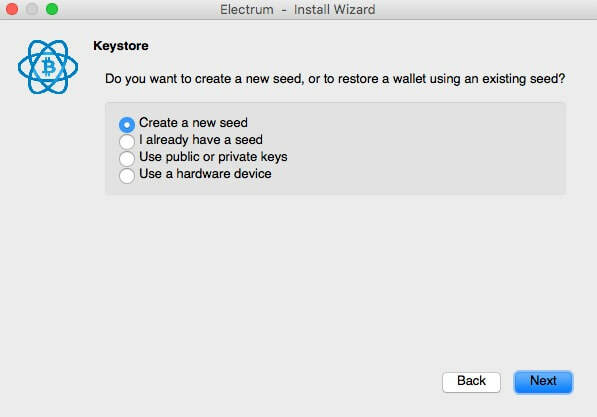 Electrum supports having multiple wallets. Each wallet contains one ore more Bitcoin addresses. An HD wallet allows you to create as many Bitcoin address as you want and the same secret phrase can magically restore your whole HD wallet with all the subsequent Bitcoin addresses created after you written down the 12-word secret phrase. Electrum also support Replace by Fee (RBF). RBF feature is a way to accelerate a transaction by bumping up the Transaction Fee in case your transaction got stuck without being confirmed. If your transaction was sent with RBF turned on (the default), you'll be able to replace the fee should the transaction is stuck. Now that you have a lightweight Bitcoin wallet installed on your computer, you can buy Bitcoin and have the seller send BTC to any address held in your Electrum wallet.